A sourcebook from the CGIAR Challenge Program on Water and Food, entitled ‘Addressing Water, Food and Poverty Problems Together—Methods, Tools and Lessons’ presents more than 50 articles on how to improve ecological and social resilience. One of the articles looks at ‘strategies for increasing Livestock Water Productivity in the Blue Nile Basin‘. 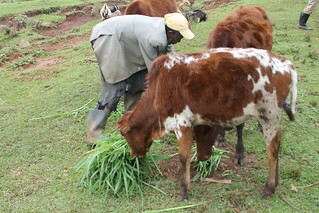 The livestock sector is socially and politically very significant in developing countries because it provides food and income for one billion of the world’s poor, especially in dry areas, where livestock keeping is often the only source of livelihoods. Livestock keeping is a major component of agricultural gross domestic product (GDP), providing meat, milk, income, farm power, manure (for fuel, soil fertility replenishment and house construction), insurance, and wealth savings to hundreds of millions of people worldwide. However, livestock raising is a major consumer of water. In regions such as the Nile where water is a scarce commodity, and the Nile Basin challenge project worked on strategies to improve livestock water productivity (LWP). LWP is a ratio of the total net beneficial livestock-related products and services to the water depleted in producing them. A water accounting approach was used to develop a livestock water productivity (LWP) assessment framework. This framework was then used to identify strategies for increasing LWP, assessing LWP in the Blue Nile Basin, and suggesting opportunities to improve LWP more broadly. Feed sourcing: One key strategy for increasing LWP lies in selecting the most water-productive feed sources that produce enough feed to meet the animals’ needs. Enhancing animal productivity: Increasing the ratio of feed energy for production to maintenance has high potential for increasing LWP. In Africa, feed scarcity limits intake, implying that most consumed feed is used to support maintenance, leaving little for production. Conserving water resources: The primary challenge to conserving agricultural water is maintaining high levels of vegetative ground cover to promote increased transpiration,infiltration and soil water holding capacity and decreased evaporation and discharge. Providing drinking water: Drinking water must be of high quality and available in small but adequate quantities. Today saw the publication of a special issue of Experimental Agriculture guest edited by Tilahun Amede, Shirley Tarawali and Don Peden.